Since I’m planning on visiting Florida in January I decided to do a little preparation by painting a few small works from photos I have taken there in times past or from the mental images I have of those previous trips. What better subject to paint when outside my door it is 22 degrees Fahrenheit and snowing? This first one is completely from my imagination. 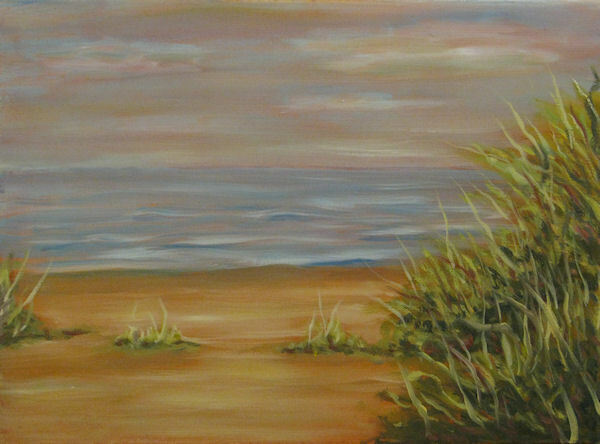 It reminds me of the times spent on the beaches of the northeastern coast of Florida. I started with a small canvas, 12 x 16 inches that had been primed with a few coats of gesso and then toned with a thin wash of burnt sienna. This is a very normal way for me to begin an oil painting except in figure work I spend much more time on ground preparation to get a smoother surface. 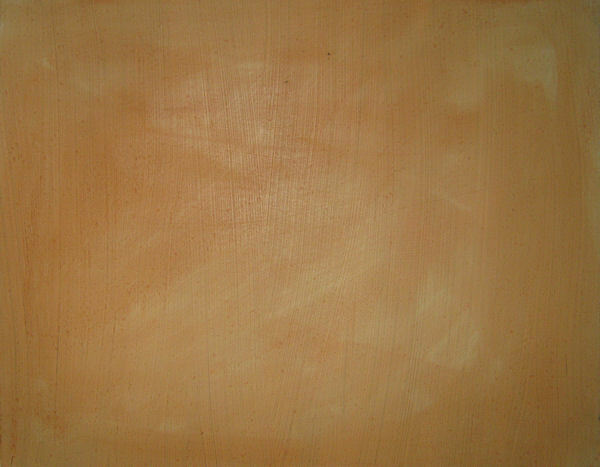 I very seldom will sit down and start with a white canvas. Painting first a toned ground in something such as burnt sienna or raw sienna gives a slight warm color over which I can paint with initial lights and darks to create a value pattern right from the start. I also prefer the warm glow this gives to the final work. At times I do something different but that is for another discussion. I don’t show any drawing here because there was none. 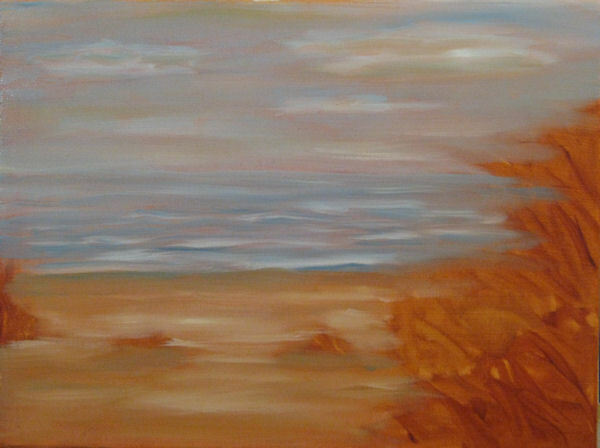 I started in with a mixture of white, cerulean blue and a touch of yellow ochre to paint the sky wet into wet using one flat brush with long horizontal brushstrokes. Working wet in wet in this way I can get a smooth and misty look to the sky with a hint of clouds. The water at this stage was done with the same colors and technique. 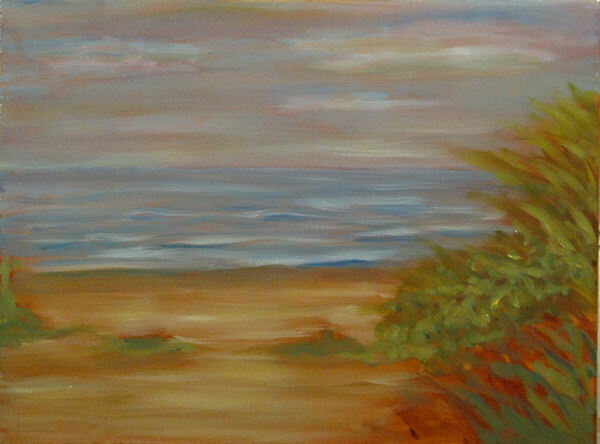 A little burnt sienna was used to sort of rough in the weeds to the right and some of the same with white was used to give the beach some definition. In the next stage I reinforced the water with more of the same colors and added some green made with various combinations of yellow ochre, naples yellow, cerulean blue and ultra marine blue. I also used the ultra marine blue to add a little darkening on the bottom of the whitest areas of the water to give it a sense of small waves. These were darker and larger nearer and lighter and smaller in the distance to enhance both the object and atmospheric perspective. In the next stage most of the work was done on the weeds. Using the same colors as I mentioned earlier I just kept adding more dark spots near the bases and longer strokes with a thin sable brush for the long weeds. I was shifting colors around constantly to keep things from getting boring to the eye. I let the painting dry over night. Very often the first question I hear when someone looks at my work, especially the figure work, is, “How long did it take you to paint that?” My standard answer is, “Most of my life.” In the case of this little one it is worthy to note it was about and hour and a half to this point. 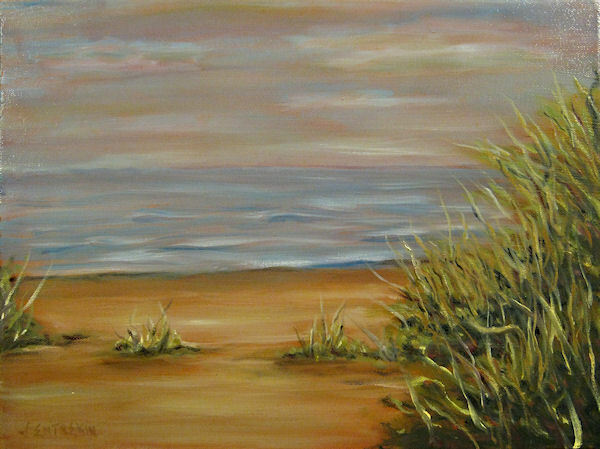 Then the next day I looked at it, gave the sky and water a very thin glaze of alizarin crimson (I don’t think it shows on a computer screen) and just spent a few minutes adding some darker blues to some of the waves, a few darks to the shadows of the sand and a few final darks and lights to the weeds.